One of the things I love about Patti Smith’s book M Train is the insight into her everyday life. How she loves a local coffee and a TV crime drama. At the Greenwich Village coffee shop, Smith has a favourite corner table and admits to experiencing a ‘petulant possessiveness’ whenever it’s taken. I have a favourite window seat at my local coffee shop and though I’ve huffed and rolled my eyes when it’s occupied, I’ve never resorted to waiting it out in the bathroom. On the days when I’m working from home and have a deadline, I like to carve out enough time for a local coffee. It doesn’t take very long but both my brain and my back appreciate a 15-minute break and I get a cup of proper coffee (no matter what I do, the stuff I make at home is dreadful), and can return to my computer refreshed and caffeinated. Turns out I’ve been practising the Swedish art of fika (pronounced feeka) without even realising it. I just thought I was having a coffee and a cake. There’s a fika book by Anna Brones and Johanna Kinvall on the art of the Swedish coffee break, available HERE. I love this…since I became self employed I have a local cafe where I can meet or sit along by a fire…enjoy a bowl of soup or coffee. And the atmosphere just feeds me. I enjoyed this read, Alyson. I had a cinnamon bun and a coffee in the Nordic cafe earlier today and it was delicious. We were on our way to the Photographer’s Gallery to see the exhibition you recommended and I really loved that too. So thanks for that. Unfortunately, I believe I Fika too much! How very civilized,plus fresh air clears the head to allow more prose…..
still enjoying your articles.best wishes. I FIKA ALL THE TIME………but without the PASTRY as I am GLUTEN FREE!!! Once in a GREAT while the husband surprises me with a gluten free pastry………………….I DEVOUR IT!Still NOT the same as the real THING!SO< FIKA away and eat one for me please!I'm the ANTIQUE GODDESS on instagram! !I have SIGNED UP for your POSTS so I will be in the KNOW!By the way I bought your book and let a friend READ before I had…….she is coming for FIKA on THURSDAY and BETTER HAVE THAT BOOK!!!!!!!!!!!!!! Oooh, good to know I’m an expert at something I didn’t know the name of. I Fika with tea, afternoons, regularly, with coffee only occasionally and generally only when someone else is making the coffee. . .
Oh my, that has my name written all over it! Now I know why it seemed that, on almost every page of the Millenium trilogy, someone was stopping off to have coffee! Drove me mad when I was reading it – started counting the number of times it happened and began to worry about how no-one seemed to eat anything other than a sandwich! My tip on special coffee for those work in the home days….buy jamaican blue coffee beans, grind them and drink with/without milk…..per cup probably more expensive than one in a cafe but so lovely! Love the way you promote a bit of Scandinavian lifestyle Fika, Hygge, Bron etc. We need that…. You have been going scandi for a while now. 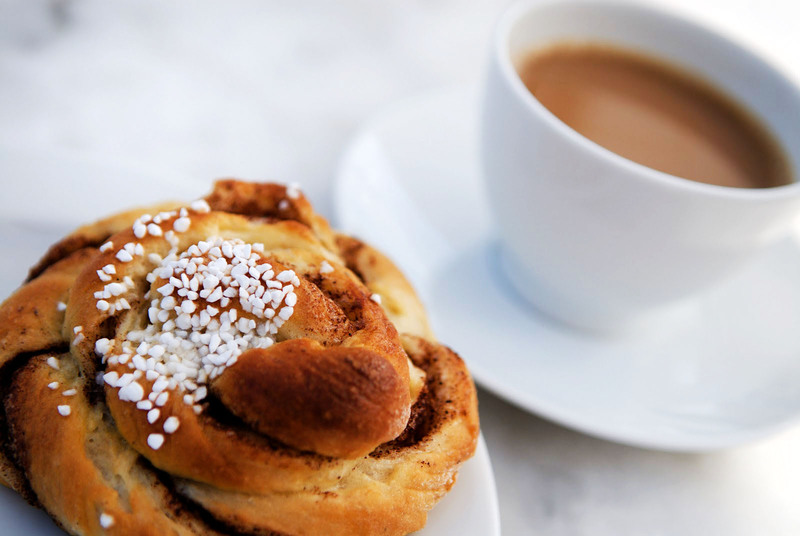 How nice, the Danish Hygge and the Swedish Fika are both gifts to the rest of the world. Being a Norwegian myself I`d like to introduce what I think we do better than most: Hytte. The mountain (or sea-side) cottage dream made possible for the average John and Sally through simplicity and pared back interiors, an open fire, a wood-burner. Charming and with a lot of Hygge. Out-door loo and water in the brook. Just sayin` to give you an idea Alyson! Thanks for mentioning Patti Smith’s book – I hadn’t heard of it before, but I’ll look for it. Fika sounds like a good habit! Coffee break, elevenses, whatever you call it, it’s nice to stop for a treat and a breather. And having grown up in a second-generation Scandinavian household, I can tell you that coffee is important! I think the key to having decent coffee at home is to buy fresh-ground and then keep it refrigerated. It’s sooooo much better than anything that’s been in a package for any length of time. I used to try and cut back on my cafe habit on financial grounds but actually I really enjoy it and often generate my best ideas in a cafe surrounded by convivial noise with the one cup of caffeinated coffee I can allow myself. I think it’s my equivalent of a bloke savouring a pint on his own in a really nice pub. One of the things I love about Patti Smith’s book M Train is the insight into her everyday life. How she loves a local coffee and a TV crime drama.